Will You Polish This Rock? Home » Rock Tumbling Library » Will You Polish This Rock? Someone gave me an awesome-looking piece of petrified wood rough about the size of my fist. Wow! It had a gray weathered surface but I could see wood grain and figured that it would produce a really nice tumbled stone. After a few weeks of tumbling in coarse grit to remove the weathering rind, I opened the barrel to discover that there were lots of parallel fractures running through the rock. You can see the results above. Phooey! We occasionally hear from someone who has a special rock that they would like to have polished. The person does not own a tumbler, but has a one-time interest in improving the appearance of a special rock or a small number of rocks. Maybe they do own a tumbler but would rather have the job done by someone with more experience. We don't offer this service because we would return most rocks to their owners without trying to polish them. Why? Because at a glance we would determine that the rock has a fracture or a shape or a texture or a mineral composition that will not work well in a rock tumbler. What About Those with Potential? Of those that we think might be polishable in a tumbler, we would have to tell the client that he or she might not like the results of the polishing job. Why? After we grind the exterior surface away hidden fractures or other defects might be revealed (see the piece of petrified wood at the top of the right column), or that special rock might have an ugly color or boring pattern. When we open the barrel after a few weeks of tumbling the rock might have broken into several small pieces. Such are the risks of rock tumbling. We don't want to gamble with a rock that used to belong to your grandfather or a favorite rock that you brought home from a wonderful family vacation. Why? There is a really good chance that you will not like the results. I really like common opal and had some nice pink pieces from Peru and some nice yellow pieces from Nevada. These looked sound but I suspected that some of them had soft spots. After a week of rotary tumbling I opened the barrel to find that many of them shaped nicely but the tumbling exploited any soft spots in that opal. You can see the soft spots, marked by white in the photo above. Opal is particularly challenging to tumble, but you can do it if you go slow, prepare it well and give it lots of cushioning. The landscaping at my home has a ground cover of rounded rocks dredged from the gravels of the Ohio River. They are mostly sedimentary rocks but included are many nice igneous and metamorphic rocks. These rocks are not native to western Pennsylvania. Instead, many of them are Canadian rocks delivered here by ice and meltwater streams over 10,000 years ago when the glaciers of the Great Ice Age were melting. A couple of times I have picked through these rocks and selected a few dozen interesting specimens that I thought would do well in a tumbler. There are granites, basalts, gneisses, and schists and many other types of rocks, plus some that would challenge the identification skills of the most knowledgeable geologists. After carefully selecting rocks that I think will perform well in a tumbler, I load them into the tumbler and run them for one to four weeks in coarse grit depending upon their shape and how much weathering rind must be removed. My goal is to expose the hidden gems inside, but I usually find that many of these specimens - hand-selected with care and an eye with a little experience - are flawed by fractures, have broken during the tumble, are deeply weathered, contain fragile mineral grains or have some other problem. Many rocks are discarded at this point because of these flaws. If these rocks were left in the tumbler their sharp edges, or liberated grains would scratch every other rock in the next step of tumbling. The point is: I had my choice of a large number of rocks, selected a few very carefully, and am still not able to produce great results with some rocks. 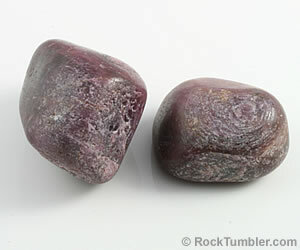 There are a few vendors selling reddish corundum as “ruby” and claiming that it is tumbling rough. Quite a few people email us asking how to tumble this material or similar corundums that they have found at fee mining sites in North Carolina. I have tried tumbling corundum of various kinds many times with consistent disappointment. The material is close to the hardness of silicon carbide grit and our aluminum oxide polish is actually a synthetic corundum (so they are the same hardness). You can tumble it to a weak semi gloss finish but if you are looking for a bring polished stone you will probably not be successful. Usually, the material is heavily included and the soft inclusions pop-out or severely overcut to leave a pitted surface. If you know how to polish this stuff, please let me know. Do You Know Someone Who Does Custom Tumbling? A few rock shops offer a custom rock tumbling service. We have compiled a list of rock shops across the United States that may do custom tumbling. It is best to find a shop near you so you can visit and show them the rock that you would like to have polished. 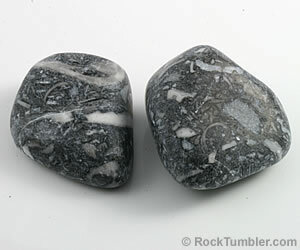 Check your local yellow pages for "rock shops" and "lapidaries". Finding someone close to you is a good idea because that allows the person to handle the rock and examine it carefully. A few photographs sent by email are not a substitute for examining the rock's texture and condition with a hand lens and under multiple directions of light. Some rock shops might tumble a rock for you, or they might have other ways to display its qualities in an attractive way. It can be expensive. Most shops that offer custom lapidary services have a minimum charge of at least $50 - paid in advance - and there are no refunds if your rock breaks or if you don't like the results. Another option would be to find a local rock and mineral club and attend one of their meetings. Many members of these clubs do rock tumbling or other lapidary arts as a hobby. You may find a member that will tumble the stone for you or help you learn how to tumble polish stones on your own. I bought some material described as “fossiliferous marble” tumbling rough. Wow! I was a great black “marble” with sharply-contrasting white fossils. (Actually, I think that a better name would be “fossiliferous limestone”.) This material was soft and shaped quickly and nicely. Then I placed it in the Lot-o-Tumbler (the machine that I use for almost all of our post-coarse grit rock tumbling). A 12 hour run in medium grit, followed by 12 hours in fine, it was now ready to polish. So far, so good. I started the polishing and after a couple hours it was starting to show a soft luster, then a couple hours later the luster was disappearing, and it finally degraded to a frosty finish. This material is just too soft to take a polish. I think that the rocks in the barrel scratch each other and any ceramic pellets that they contact are abrasive rather than helpful. I think that it also sheds tiny mineral grains that are coarse enough to contaminate the polish. Again, if you know how to polish this stuff, please let us know. 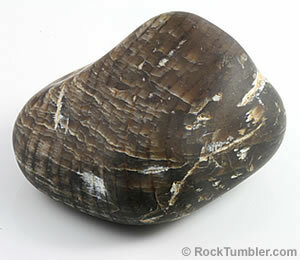 If I owned a special rock and wanted to have its appearance improved, I would first try cleaning it using water and a toothbrush or a plastic bristle household cleaning brush (be sure that your rock or mineral specimen is hard enough and competent enough to accept this gentle cleaning and be sure that it is not soluble in water. Gypsum, calcite and other soft minerals - softer than four on the Mohs Scale - can be scratched by this type of cleaning). Also, rocks with fractures might break under the stress of a gentle brushing. Examine carefully before you decide to attempt cleaning. If your rock needs a more vigorous cleaning, you can take it to a mineral specimen preparation service and ask if the rock has any potential. Yes, there are professional "rock cleaners", an example is Justin Zzyzx in Los Angeles. A professional cleaning can dramatically improve the appearance of a rock, fossil or mineral specimen. If you want something beyond cleaning, lapidary services have saws, grinding wheels of various kinds, laps of various kinds, along with cleaning tools and solutions. 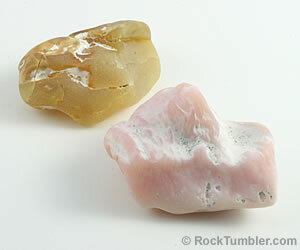 These expand the possibilities of success far beyond cleaning or processing in a rock tumbler. This type of service is hard to find in many parts of the United States. You might try looking for "rock shop", "lapidary" or "mineral specimens" in your local area yellow pages or using a search engine to see what you can find. One example of people offering this service is: Sticks-in-Stones.com. Be sure to call or email before you travel a great distance to avoid disappointment. 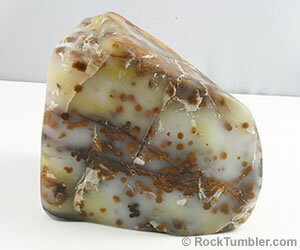 Polka Dot Agate is one of my favorite materials. I marvel at how the round black “dots” can be suspended in white to yellow agate. I had a nice chunk a bit larger than my fist. It looked “sound” upon examination by hand so I decided to try tumbling it. I placed it in a rotary barrel with nothing but large ceramic pellets. It was swimming in ceramic pellets. After a month of tumbling I opened the barrel to find that it had a few thin cracks that would prevent it from becoming a nice big tumbled stone. But, at least it will make a lot of really nice small stones. Some Rocks Are Best "In The Rough"
One of my favorite rocks is a nice piece of Crabtree Pegmatite from western North Carolina. This rock is from a mine that was operated by Tiffany and Company in the late 1800s. Why was Tiffany running a mining operation in North Carolina? Because a narrow pegmatite dike cut through the ground and near the edges of that dike the pegmatite was composed of quartz, feldspar, schorl tourmaline and emerald. Yes, real green gemmy emerald. I really like this rock and it would make a fantastic tumbled stone, it could also be slabbed and used to cut cabochons (that's how most of this material was sold when Tiffany and Company operated the mine). I am also tempted to have it slabbed and cut a few cabs from it. I've seen Crabtree Pegmatite cabs sell for three digit numbers and I think that this rock would produce at least four good ones. But, its a fantastic rock "as is" and has a great story behind it. Even though I like tumbled stones and cabs a lot better than I like rocks, I am going to keep it a rock because tumbling it or cutting it comes with a lot of risk and this rock is so nice and such a great conversation piece that I will keep it "as is". And, I don't think that I will ever change my mind.